I look down to hide my embarrassment. I can feel him staring at me, and the tension is beginning to grow thick in our small quarters. He is sitting very close to me, even if we are separated by the back of his seat. When Owen was in the car with us, the atmosphere was light and funny. But now, it’s dark and intense; it’s laced with something I don’t understand and don’t want to discover. I try to think of something to say to take his focus away from me and my life. “It’s just a job,” I say dumbly. Loretta Lost knows how dark the world can be, but chooses to believe in happily-ever-afters, despite all evidence to the contrary. If you are new to Jordan Deen’s fantastic world, you can find The Crescent for FREE on Amazon, Barnes and Noble, Smashwords, and iTunes! Lacey is so focused on her future that everyday life has past her by. Counting down the days to her eighteenth birthday, Lacey is almost home free. But when she falls for the mysterious Alex Morris, she lands in the middle of an ancient war between two enemy wolf packs. Tempting dreams, tantalizing lies and a dangerous love triangle ensues leaving Lacey heartbroken and confused. Lacey’s fate rests in the hands of Alex and Brandon, but both are pulling her strings for their own agendas. Even as she slips further into the dark world of werewolves, Lacey struggles to find the truth and save the only family she’s ever known. I’d been a fool for coming here with them, and now… no one would come to save me. The world that hid in the shadows of humanity was full of enemies. Faced with death, Lacey Quinn ran away from the only family she’d ever known. That… was just the beginning. As the decision she’s made sinks in, Lacey struggles to fit in with the pack and find the key to bonding with her werewolf soul mate, Brandon. But, lies can only be concealed for so long. Adjusting to a powerful new best friend, a twelve-year-old roommate with a nauseating Barbie fetish, and a lost love that won’t stop haunting her dreams, she knows she has no hope of having a normal future-ever again. After a long talk with the dead mother she never knew, and an almost deal-breaking night out with Brandon, Lacey starts spiraling into the underworld-a place where all things are possible and everyone is out to kill her. With mysterious legends of witches and sorcery marring her past and clouding her future, she quickly learns-werewolves aren’t the only ones lurking in the woods…waiting to claim her powers for their own. The Mares? Well, they are the least of her worries. 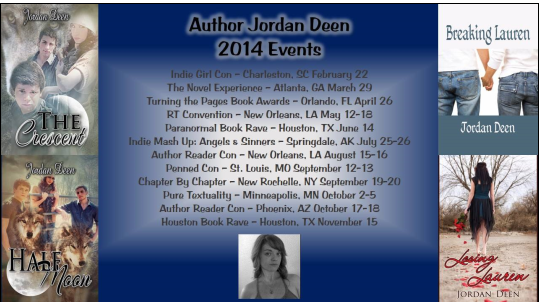 Jordan Deen will be at the following events in 2014. Come see her! The idea for the series came from a crazy stormy night. My German Shepherd became really protective and wouldn’t let me go back into the house and I got scared there was someone in there. 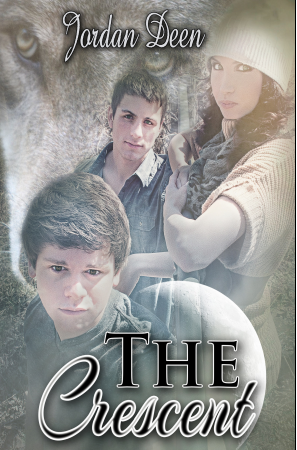 The Crescent is the first paranormal novel I wrote. Grant is based off of my best friend’s ginormous dog that likes to use unsuspecting laps to flop in. Full Moon is the finale of the trilogy and will feature a blend of werewolf and witch legend. Exclusive information: The release date for Full Moon will be 4/18/14. Jordan: I love this part because Alex is shamelessly embarrassing Lacey in class. Jordan: I chose this one because is perfectly shows the difference between Brandon and Alex—Lacey’s two love interests in the novel. One wants her to hide behind her secrets, the other wants her to come into the sun and enjoy her uniqueness. Jordan: I picked this one because Lacey is trying (in vain) to put a leash on Grant and he is fighting her with everything he has in her not to go on the leash. The entire time I was writing that section of the story, I couldn’t help but laugh out loud. Q: You recently became an Indie Author after re-releasing your titles outside of your previous publisher. What has that change been like? Jordan: The Indie world is so much different than the traditionally published world. You have so much more control over your work and how you want yourself to be represented to the public and to your fans. It is an amazing feeling to be able to connect with people in ways that hadn’t been available to me before. I think it’s one of the best decisions I’ve made. I love the Indie world. Q: The Crescent centers around a world of wolves. Why wolves? Jordan: I’ve always had a soft spot for wolves because I had my German Shepherd, Biscuit, that looked like a giant black wolf. He was a rescue dog that I got when he was about a year old. He lived until he was thirteen and he was my buddy. I still miss him dearly, but I have this story to remind me of some of the hijinks I had with him. Q: How would you describe Lacey, Alex, and Brandon to those new to The Crescent world? Jordan: Great question! So, to keep things organized, I’ll bullet point each character. Lacey- she’s grown up in a family that she doesn’t fully understand and that makes her social awkward and a little stand offish. She really wants to go to college to get away from her clicky high school, but her parents don’t want her moving away and that almost makes her desire moving even more. She has one best friend, Jillian, that she is fiercely loyal to and she’s never been boy crazy or head over heels for anyone. Alex—oh my. Alex is hotness in a heather-grey shirt and slouched jeans. He is that boy that you stop to stare at when he walks in the coffee shop because you think there must be a commercial being filmed or something. He is confident, smooth and a little cocky (but hey, he kinda can be). He causes a lot of confusion and sexual tension in Lacey’s world and his arrogance really is endearing and annoying—all at the same time. Brandon—he is hot but in a much different way. He is that boy next door that you’ve known since you were five that would do anything for you. He’s the guy that would help an old lady across a street and save a kitten from a tree. He’s the dependable one and only has eyes for Lacey… how can you beat that? Q: What can readers look forward to in the next book, Full Moon? 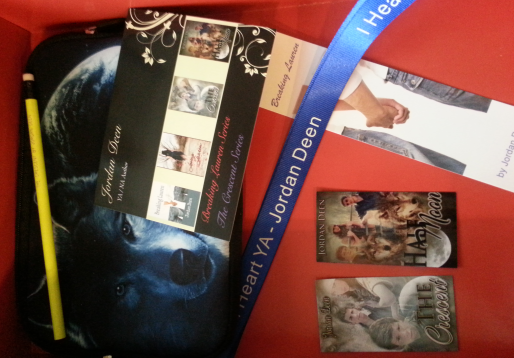 Jordan: Full Moon is the final book in the series and it has been the hardest book I’ve ever had to write. I’m going to miss these characters so much. They’ve been living in my head for almost four years now! Full Moon is a very deep book—emotionally and mentally. Fans are going to see Lacey grow into the world of werewolves, but she will start to embrace her witch side too. There is a lot of witch prophecy that is introduced and we get to meet some new characters with very interesting talents. I can’t wait to share it with everyone. Q: Is there other publishing news you would like to share coming in 2014? The door felt like it was made out of cement as I got it open. I threw my body against it to get it closed, afraid that my weight wouldn’t be enough to stop whatever was about to start pushing it open. I twisted the deadbolt until the lock clicked, not that I really thought the small lock or door was any match for what my imagination knew had chased me to my house. My chest heaved as I struggled to catch my breath with my back firmly pressed to the door waiting for something, anything. “Come on now. I can’t just go walking down the street with you. What if you run off? I’d never forgive myself if you were hit by a car.” Then again, the car would probably suffer more damage than the dog. I tried not to grin at the thought as I took aim and attempted to get the leash on his collar but he jerked away. I ended up doubled over him with my head to the floor and my feet towards the ceiling over his back. I slid myself slowly onto the floor and lay there looking up at the dog looming over me. “Ok, this is not going to work. How am I going to find your owner if you aren’t helping me?” He sprawled out flat on the floor next to me and laid his head on my shoulder. He was not making this any easier. Dad would blow up when he got home if the dog was still here. “Grant, I know you like it here. But you have to go home. Dad will never let me keep you, and I’m sure someone is missing you.” He let out a small whimper. Jordan Deen is an Award-Winning Young Adult and New Adult Author from East St. Louis, Illinois. Her debut novel, THE CRESCENT was a 2010 Reader’s Favorite Award Winner. 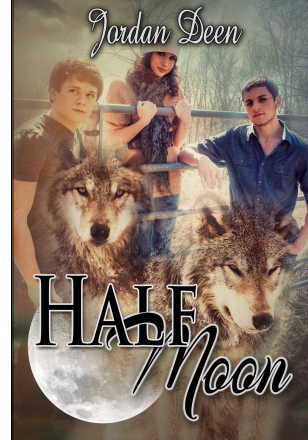 Her second novel, HALF MOON is now available. The first installment in her second series, BREAKING LAUREN is her third novel and was a finalist in the Texas Literary Awards.